Recycle an old pusher to a Paddler? My ambition to build a Paddler go’s back to 1985 when I saw a Mississippi Sternwheeler, all lights on, appropriate music playing with the paddle wheel running. Not on the water but on a show table, I was impressed. It was another 3 years before I started to build model boats. My hobby interest still involved aeromodelling and Military modelling. 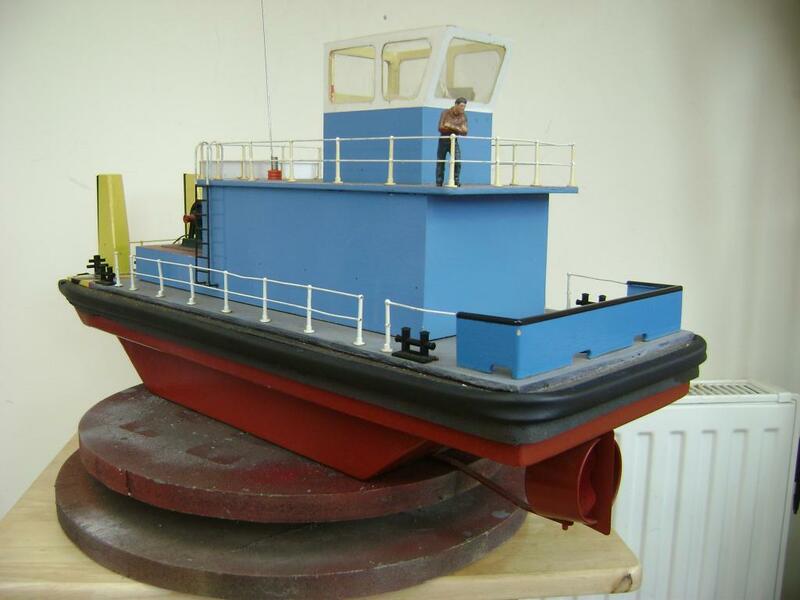 The nearest I came to starting a Paddler was around 1994 when given a plan of a Director class Tug. A start with the feathering paddle version, the one I opted for. The parts I made are in a box in my garage, thats as far as it got. I’m sure when I am looking for something else they surface and will post the parts I made. Recycle an old redundant pusher tug. It’s past use, my Wife’s entry in the tug towing comps. 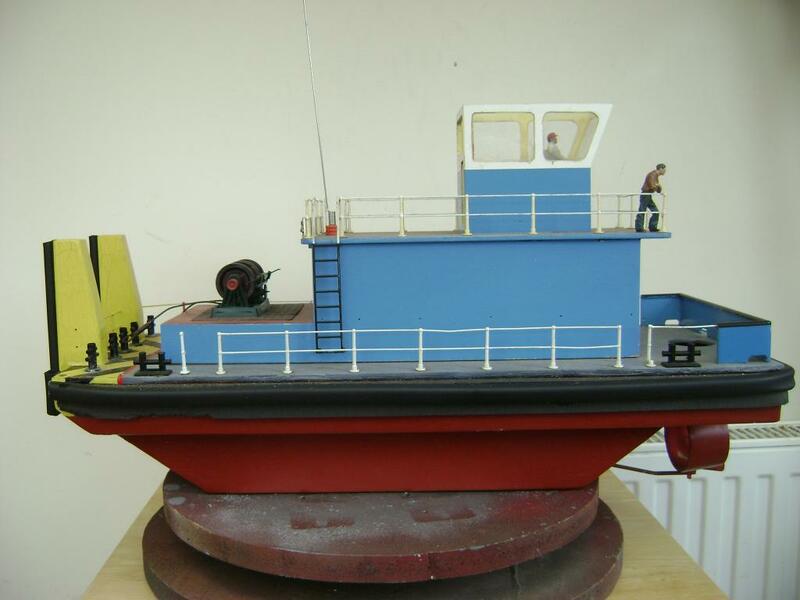 I built it from a free model boats plan, increased in size, the two little props replaced with a steerable Kort nozzle. In fact only a vague resemblance to the original plan. Piccy's when I've loaded them to Photbucket. The donor. I made it to be used in two different operation modes. This is the Tug taken an hour ago. 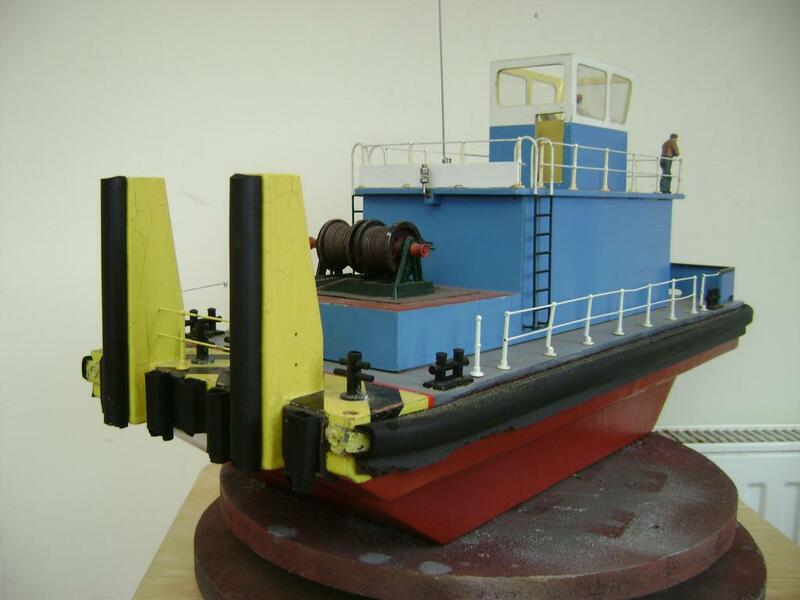 This is in the configuration used when it acting as a stern Tug in 2 man towing. 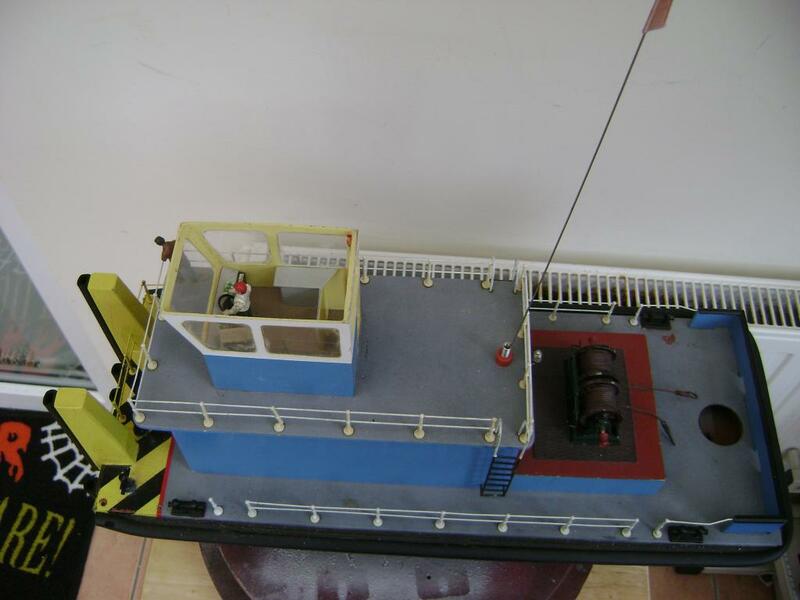 The top reversed so that using the winches it could be pulled up tight to the barges or as on one occasion I pulled in tight to the stern of a 7ft Tanker and took it round a course without the need of a bow tug. The winches in these pic’s are not the originals working ones I had fitted and referred to. Just me I thought it would be an unfair advantage to other competitors, so removed them fitting non working ones. So it was always used as in mode 1. After looking at the plans for Wrigley 121 my thoughts are the pusher could be modified without to much work. All the running gear, electrics removed years ago. Empty hull loads of room available. So thinking with the top put in mode 2. Wheelhouse off would need new one anyway. Alter the stern to take the paddlewheel. I like Damien's take on mounting the motors. (Lady of the Lake). The bow could be left as is, my preference is to take off the posts extend and reshape the hull and deck. Add a derrick to vaguely resemble one of Uncle Sam’s tooth pullers. Still open on that if anyone has any suggestions please, they would be most welcome. Indeed this model would convert readily look forward to watching your build. I like to keep the weight in my models as low as possible. So going for a single drive motor located in the bottom of the hull with sprocket and chain for the final drive. Will go for a single full width paddle, not two split as per Wrigley. My reasoning being. The early Snag boats would have been conversions of the regular sternwheeler design. If anyone knows differently, please let me know! Wadsworthj your MYRYLE CORY a very interesting model. Particular the crank and connecting rod. I like movement, authentic touch simple to replicate. So it will incorporate features I have seen on other models or the real thing. If I like it, I will give it some thought, maybe try it. This is probably as far as I go today. Youngest Grandson is taking me out for the day. (It's to introduce his first serious gilfriend). Gathering information, if anyone can help please. 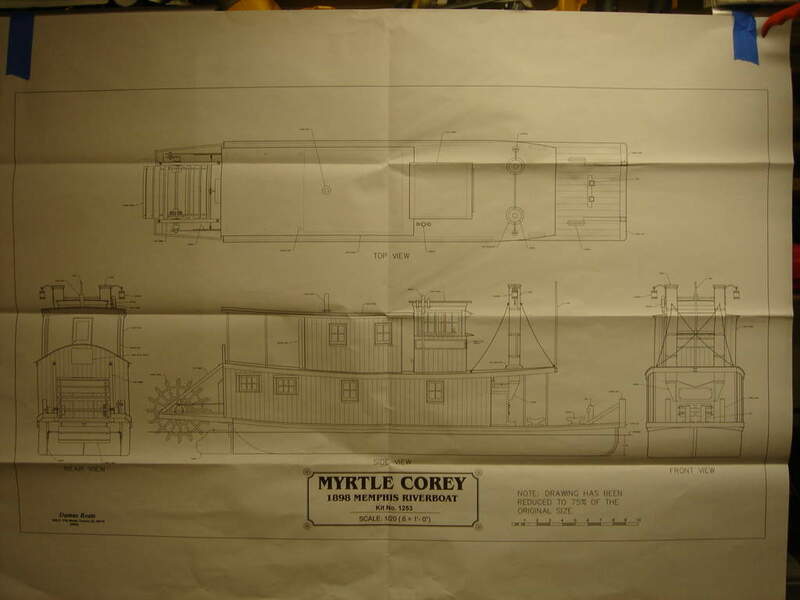 Myrtle Corey. 38” x 8 ¼” x ? So adding 17” to the length, a work boat something along the lines of MC looks promising. MC Information I would like to have. Dimensions of the Boiler casing? Length, width and height. Dimensions of the Paddlewheel.? I only require width and diameter? 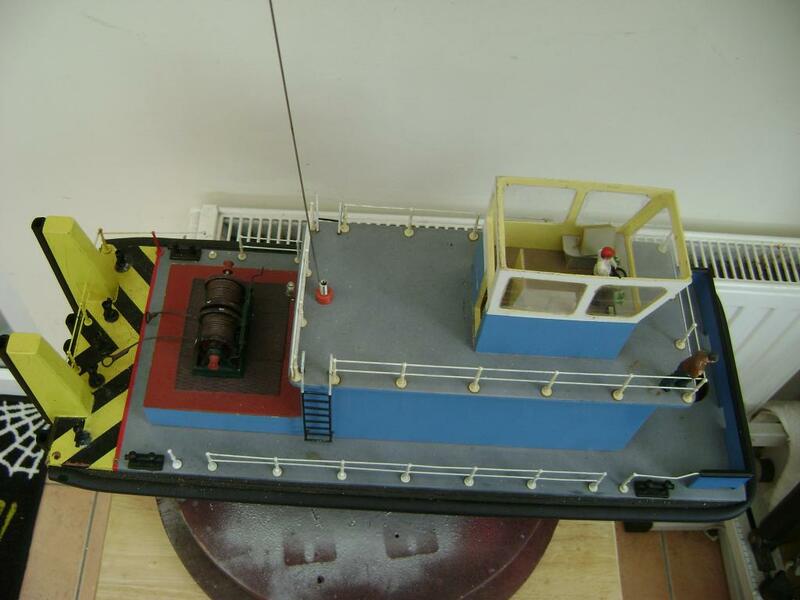 Modellers do modify, rebuild and recycle old or damaged models if its viable project. The alternative is bin it. 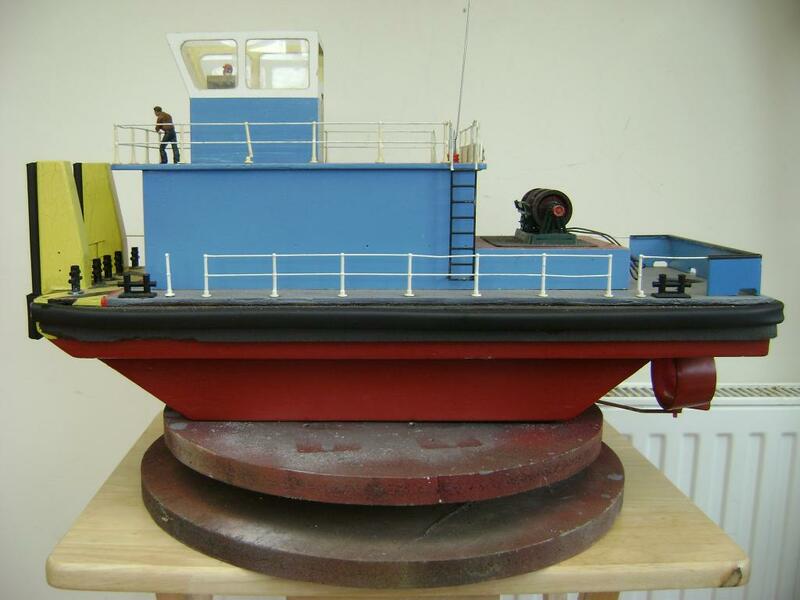 It was an old redundant model I built for Tug handling competitions only. Stripped of all useable items what is left can be recycled. I have always fancied building a Paddler so this is somewhere to start. If it works as I want then I will build a Mississippi style showboat. If its not up to expectation all I have wasted is time. I had started the reply to your previous post Paul, so missed the plan. Thanks the plan doesn’t have the boiler details, its only the boiler I am interested in on that model. Ok Paul will try that later. It’s only an assembly drawing not a dimensional one. The hull prints out at 143mm long x 28mm wide. The model is roughly 9065mm long x 210mm wide. It needs someone with a built model to physically measure the boiler casing. I only need the length, width & height. The rest I just wing it, if it looks ok that’s fine. I’m not building a scale model of anything in particular just disposing of a model and trying something I haven’t built before. Have faith it will look ok and work. Trust me! Not posted for a couple of days, not so good days, damp and cold (& I live in the sunny south). Aggravated by three fingers on my left hand were white, no feeling and annoying. I have visited that forum several times Paul the 1/32 Scale W.T. Preston Sternwheeler Build very impressive too, all 96 pages. At 62 inches long, wheel 6 ½” dia x 7 ½”wide. Much larger than I could physically manage. This pusher was the last boat I built in 2004 after this date house move. Two major health issues, model building curtailed. Only taking models to one show per year last one 2011. Then the second problem but slowly getting back into the shipyard. So where better to start. It’s not a disaster if it doesn’t come up to expectations. If all go’s to plan I can sit in the bathroom and watch it make waves in the bath. The object is two fold! Do something I enjoy and get me away from the TV . Back now. I’ve had a lot of visits Doc's, Hospital, Tests that sort of inconvenience. So hopefully I can get back to dreaming paddle wheels. Oh no!!! it should be doing something with paddle wheels..
TV one of the great thieves of all time, along with computers and my real pet hate The Telephone. Back to the recycling job. As the object is to reuse as much as possible of the old pusher. Most of the deck fittings have now been removed. The posts from the bow I think will be used for the wheel supports. Running the measuring stick over them and the hull I will have space for a wheel diameter of 6” max, by 5” max width. I am thinking of using the bow as the new stern. I will modify the old stern into the new bow, by increasing the length by 12 to 14 inches and reshaping it. It’s cold and very wet outside, even the cats refusing to move. The postman making things worse, wearing shorts, soaking wet and the parcel I signed for not mine, next door neighbour. So search the net, watch TV or scribble something on paper. Tomorrow is another day, see how things go. Not posted lately, I did not disappeared of the face of the earth, just my wife and I plying pass the flue or whatever the virus is going around back and forwards. Back to the build I have found some sketches I made for a larger showboat type stern paddlewheel 6” dia X 7 ½” width. 18 spokes/paddles. I thought I would keep the dia at 6” but decreasing the width to 5” and number of paddles to 8. So experienced paddlers the question. Will 8 paddles be too few or should I go for something like 12? But think positive. you lost some weight. If I loose it, it finds me again. 8 paddles equates to every 45deg pitch. It’s just easier to fabricate at those angles. Giving me 0 and 90 deg for quartering the cranks. 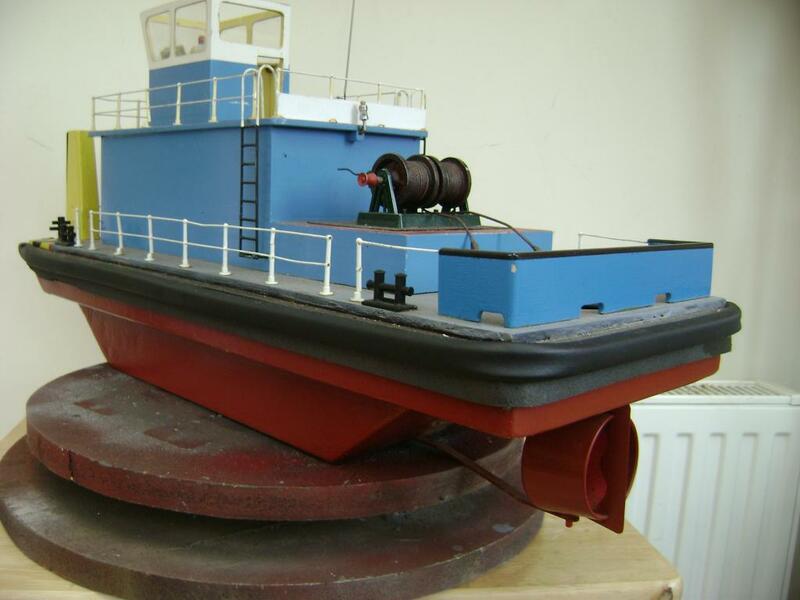 It’s not going to be a scale model, so may look more authentic for a work type boat. The 18 paddle setup it is 20 deg pitches so a separate setting op for quartering. The 18 configuration was for a possible Mississippi sternwheeler which were more ornate and seem to have around this number of paddles. I have not built a Paddler before so opinions needed please. I have no experience with model paddle boats, so i'm unable to offer a suggestion to what to actually do, however that said i do have a suggestion on how to progress, in a situation like this when i'm unsure how something might look or will effect the models working ability's etc i will fall back on the old tried and tested methods of doing mock ups with card, or plastic card which is a cheap solution to create the item a couple of times over to see if i like it, it works or if is even practical. In your case it may be worth mocking up some paddles in card one with 8 paddles another with 12 and another with 18 and seeing which one u like the most. Thanks for your helpful observations. I do have all three laid out on paper. You have similar thoughts to myself. Re more paddles lower RPM. Etc. I’m not sure if the main factor is the RPM. I’m more inclined to the surface area of paddle or paddles in the water. The vertical one powers forward, the ones entering produce lift/drag, exiting drag/down force. Only my opinion, probably only 50% correct. I am doing what I usually do, that is analyse too much first before committing to production. The measure twice, cut once syndrome. At my age its measure about a dozen times first! Because I will have forgotten what I was doing let alone remember a dimension. I can only offer more direct advice by passing you onto the paddle duck forum which is dedicated to paddle type boats and run i believe by our forum moderator Damien, if you weren't aware of that particular forum. Correct Aron Damien Jr hosts Paddleducks from his business In NSW Aust. with myself and Eddy the the Admin team. Brian there are lots of folk with info on paddle boat full size and models only to happy to answer questions sometimes conflicting answers you'll pick what peaks your interest the most i'm sure. Ps: You need to join to post a question though, have a browse chances are you'll find your answer anyway. I have been a member of Paddleducks for four years, as many RCMB forum members are too. But I find it is more suited for the specialist type of modeller. I would have been saddened to have seen it go, but fortunately Damien Snr & Jnr stepped in and saved the day. It was at that time that Damien steered me towards RCMB. Which I prefer for the wider general modelling subjects, and my conversion is just try a different method of propulsion. My absence from the forum has been a combination of health and decorating (watching my wife decorating), my input unfortunately now is very limited. But weather improving so hope fully I will restart the conversion. With this observation by my family. 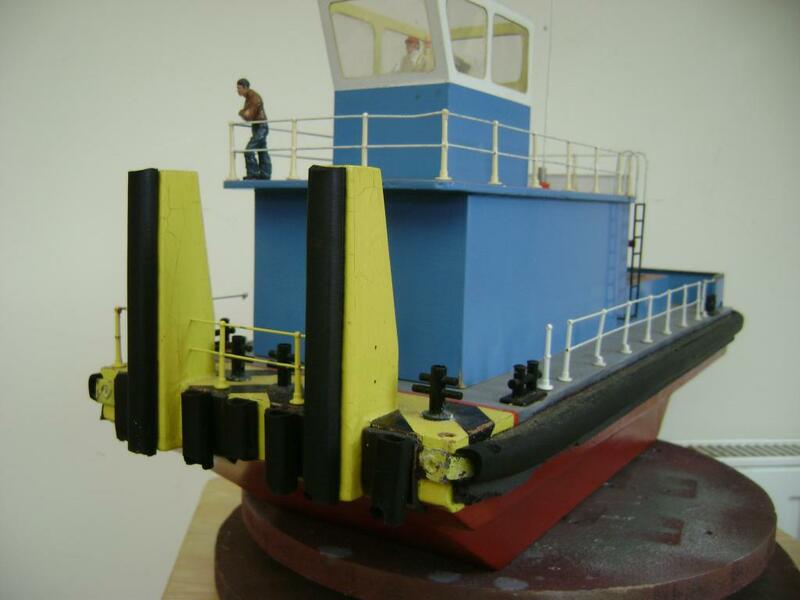 My days of scale modelling are in the past, (now think! “It’s only a puppet” ). So I will take it from there. A quick explanation for my lack of interest or progress with this project. Since I posted last, My Wife suffered a major heart attack and could not be resuscitated. Life is still crap at the moment and all modelling activity’s only gathering dust. But I will finish it, just not yet. I think I can speak for us all on here Brian and send heart felt condolences to you and your family for your very sad loss of your good lady. you don't have to apologise for anything, and we hope that in time, when things are a little brighter for you, that your model will be blown free of it's dust. take care and our thoughts are with you all . My condolences as well Brian look after yourself first mate knowing we're all thinking of you. Along with the Damien and Neil, my thought are with you at this sad time, take your time and things hopefully will get a little easier to bear. My mood is very much like our weather, at present it’s cold, wet and miserable. Fortunately I’ve not had to suffer the floods or the disruption and loss of cherished items so many have endured recently. The positive is my lateral thinking head is beginning to work; (it's the one I use for modelling). So I will soon be restarting the conversion. It's good to hear from you Brian, it would be nice to see you getting back to your modelling, I love seeing how other folk do things. I've not been doing a lot with my boat projects, to much other stuff to do like building a shed extension with a large bench specially for modelling . I promise to be back to the boats soon. It will be good to see some further progress on your model,it is something out of the ordinary. Ease yourself back into the build slowly,and you will soon be making an impression on it. Thanks Paul & Mick. Yes I’m now easing back into the shipyard. I’m collecting things I think maybe of use in the reconstruction work. So far they are just throwaway items; my “What can I use this for”. I will photograph what I have when I locate my camera. Good to see you climbing from the gloom Brian It's so hard when you lose a loved one and I'm sure we're all looking forward the your post. Yes that was last year, the worst in my lifetime. Now another year, so onwards and upwards as they say. I forgot to say good luck with the shed extension Paul. I think Noah started with a shed first, then the extension for his model boats. But like most of us, he went bit over the top with the embellishments. Long time now but ready to restart this project in the new year. I have been busy helping set up a modelling club and learning 3D printing & Laser Etching/Cutting. I am sure that Damien and our friends down there will recognize the plane. Have an enjoyable time over the festive season. Eat, Drink and be Merry (sod it, we don't last forever). Hit the buffers flat out then say what a ride!!! Can I have another go? Subject: Re: Recycle an old pusher to a Paddler?